Helen Bowen is a cop, and she should not be part of this heist. She can’t even really remember agreeing. But here she is, confessing to everything: the identity theft, the international jet-setting, the local grocery shopping, the code names, the drag shows, the newly re-opened laundromat and dry-cleaning service. But the heist isn’t over. It’s barely begun. And Helen doesn’t even know the half of it. 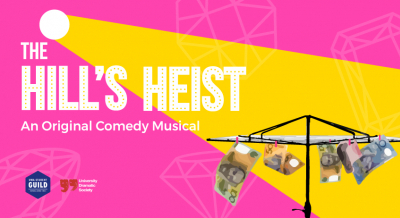 The Hill’s Heist is an original comedy musical about convictions and conflictions, rights and not wrongs, hills, heists, and a load of dirty laundry. This performance is suitbale for children aged 12 and over, and contains swearing, adult themes, strobe lighting effects and haze smoke.